The idea of sophisticated life on the moon might seem absurd today, but when a story about lunary civilization appeared in newspapers in 1835, many wondered if it could be true. And that's hardly the only scifi story readers have found credible enough to believe. Top image: Lithograph of the Great Moon Hoax, via Wikimedia Commons. Hoaxes, of course, have a long history in science and science fiction. Just this month, the Discovery Channel aired a fake documentary about the Megalodon with a blink-and-you'll-miss-it disclaimer. But there are decades of fake robots, fabricated scientific discoveries, cryptozoological taxidermy, and scifi movie productions that were actually scams. That's before we even get around to mentioning the Orson Welles' production of War of the Worlds. Real-Life Casualties from "War of the Worlds"
In print science fiction, hoaxes hold a particularly special place. A lot of proto-scifi took the form the "hoax stories," some of which appeared in newspapers. Sometimes these were stories that were genuinely meant to deceive the reader, but in other cases, they were simply a way to frame a fantastical story in a semi-realistic way. And even as science fiction matured and grew, sometimes tall tales were made even more engaging when the author claimed they were true. This is by no means an extensive list (and please do share your favorites), and while some of these fall clearly into the category of science fiction, others are false accounts of scientific discoveries and achievements by famous fantasists. And while some of these were deliberate hoaxes, others were accidental—and sometimes the authors continued to assert the truth of these tales after they were generally disbelieved. Also, be sure to read our list of "memoirs" that read more like science fiction and fantasy stories. 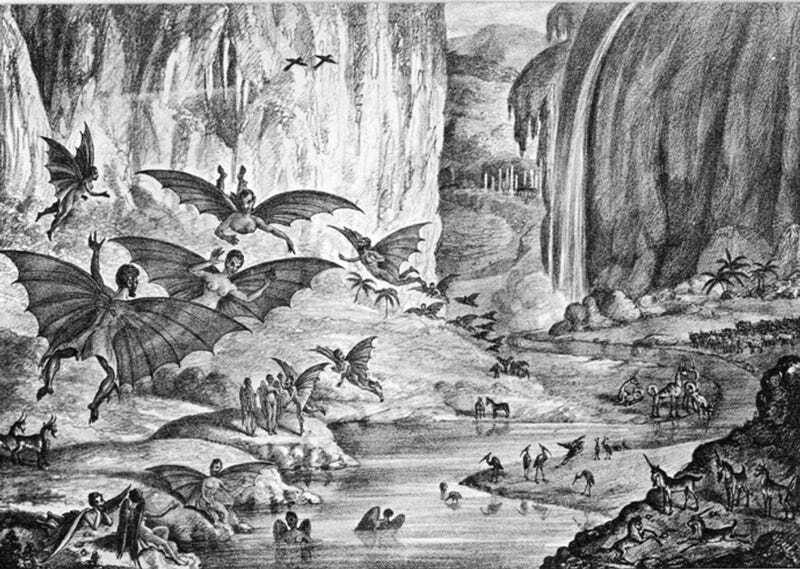 The Great Moon Hoax of 1835: One of the most famous scifi hoaxes comes from a series of six articles that were published in the New York Sun during the final week of August 1835. "GREAT ASTRONOMICAL DISCOVERIES LATELY MADE BY SIR JOHN HERSCHEL, L.L.D. F.R.S. &c. At the Cape of Good Hope," the first headline read, along with a claim that the article came from the Edinburgh Journal of Science. The articles claimed that, by means of a powerful telescope, astronomers had discovered life on the moon—not just life, but incredible life. The articles spun tales of lunar bison, blue goats, and, most incredible of all, winged humanoids with their own civilization. The articles created a huge boom in the Sun's circulation, although Museum of Hoaxes notes that the Sun's already widespread circulation is a likely reason that the hoax was so successful. Other New York papers began reprinting the accounts, and we know from writings at the time that a number people believed the tales of life on the moon were true—or that they at least might be. The story was the talk of New York as people debated whether the reports were genuine. Certainly not everyone was taken in by the hoax (nor even the vast majority of readers), but there were plenty of folks willing to contemplate the fantasy of life not so far away. On August 31st, 1835, James Gordon Bennett, founder and editor of the New York Herald, pointed out in his paper that the Edinburgh Journal of Science had ceased publication in 1833, and thus could not be the source of the "discovery." Furthermore, he fingered the series' likely author, Sun editor Richard Adams Locke. For weeks, the Sun and the Herald engaged in a war of words as Locke and Sun publisher Benjamin Day continued to deny that they were the authors of the tales. In fact, Locke never admitted to being the works' author, and some have speculated that another prankster might be responsible for the fanciful stories. Sir John Herschel was, however, a real person, and the notion that he'd discovered life on the moon was news to him. At first, he was amused by the hoax, but years later, when his name was still associated with flying people on the moon, he grew annoyed by the Sun's apparent bit of sport. What followed was a bizarre tale, bolstered by a reference to a fake news article from the Auburn Messenger that claimed that a man named Leonidas Parker had murdered one Gregory Summerfield by pushing him in front of a train, only to have his case dismissed by a judge. Parker's documents, the report continued, explained why the judge had let him go free: Summerfield, the report claimed, had invented a substance that could burn water. He then blackmailed the leaders of San Francisco, threatening to set the Pacific Ocean aflame and thus destroy the world unless he received his financial demands. The story was quickly picked up by other California papers, and readers wondered if such a substance really existed. But it wasn't long before journalists at the Sacramento Reporter had identified the author of the piece from his initials—W.H.R., better known as San Francisco lawyer William Henry Rhodes. Even after he was found out, Rhodes kept up the joke, issuing a statement to the Sacramento Union that he would offer proof of the case to any "honest inquirer." Then, a few weeks later, the Sacramento Daily Union published "The Summerfield Case Again." This article claimed that one Bartholomew Graham, a bandit known as "Black Bart," was believed to have in his possession a vial of Summerfield's deadly substance. According to Sam Moskowitz's book, Science Fiction in Old San Francisco: History of the Movement from 1854 to 1890, many found the notion of Summerfield's substance too plausible to be pure fiction and it was cause for a great deal of nervousness. Rhodes would continue to publish works of science fiction like these under the pen name Caxton. "The Case of Summerfield" inspired a pseudonym of its own; the outlaw Charles Earl Bowles is said to have taken the name "Black Bart" from Rhodes' bit of fiction. Multiple Works by Edgar Allan Poe: It's likely no coincidence that Poe was both an early writer of science fiction and a notorious hoaxer; his business was crafting ideas that could worm their way into the brain and suspend your disbelief. His first, albeit not terribly successful, hoax-style piece was published in 1835, the same year as the Great Moon Hoax, and similarly involved the moon. "The Unparalled Adventures of One Hans Pfall" involved a man who journeyed to the moon by hot-air balloon, which was published in the Southern Literary Messenger, and wasn't widely believed. He'd have better luck with his 1844 Balloon Hoax, which was published in the Sun (by none other than suspected moon hoaxer Richard Adams Locke), and claimed that the famed balloonist Monck Mason had crossed the Atlantic Ocean for the first time by balloon. Poe claimed that the excitement over the article was so great that he himself failed to obtain a copy. The story was quickly revealed as a hoax and the Sun printed a retraction. By this time, Poe was already a practiced hand at hoaxing. The Journal of Julius Rodman was serialized in Burton's Gentleman's Magazine (to which Poe was a contributing editor) in 1840. If the account of a 1792 expedition across the Rocky Mountains had been true, it would have marked the first journey of a European across the range. The unfinished novel was treated by many readers as authentic, to the point that the "fact" that Rodman led the first expedition across the Rockies appeared in an official US Senate document. A December 1845 issue of the American Whig Review contained a shocking account of a man named Ernest Valdemar, who was put in a hypnotic trance at the moment of his death, and remained that way, without heartbeat or decay, for several months. Today, we know this as the Poe story, "The Facts in the Case of M. Valdemar," but at the time, it was taken by some as possible truth. Like so many successful hoaxes, the story was much republished, and famed mesmerist Robert Collyer claimed he had pulled off a similar act and had no doubts about the veracity of the account. Poe fielded numerous letters from curious (and in some cases, fully deceived) readers, assuring them the story was a work of fiction. Less suggestible readers took the tale of hypnosis for what it was: a chilling work of horror. My sincere opinion is that nine persons out of ten (even among the best informed) will believe the quiz (provided the design does not leak out before publication) and that thus, acting as a sudden, although of course a very temporary, check to the gold-fever, it will create a stir to some purpose. However, the piece was laced with references and jokes, and many Poe critics indicate that the tale of Von Kempeler was likely seen as satire, not a possibly true tale. The Shaver Mystery: While many of these hoaxes appeared in the pages of newspapers, the strange tales of Richard Shaver appeared in a place well known for publishing fiction: Amazing Magazine. One day in 1943, Amazing editor Ray Palmer opened a letter from a man named Richard Shaver, who claimed to have discovered that the Earth had once been populated by and underground race of highly developed creatures, creatures who had fled Earth, leaving behind their offspring, consisting mainly of the savage and sadistic Deros. Shaver said that he had first received accounts of a torture session within the Earth's caverns through his welding gun at work, and gradually uncovered the truth about the hidden Deros evil. Palmer was intrigued by Shaver's first letter, and immediately wrote back to him, initiating one of the most controversial chapters of the magazine's run. The Shaver Mystery is often described as a sort of proto-UFO hoax. Shaver presented Palmer with pages and pages of rantings, claiming that he had been held captive by the Deros for several years and that the Deros were responsible for untold ills in the world, from minor injuries to massive natural disasters. Palmer cleaned up and punched up Shaver's accounts. The first Shaver story, "I Remember Lemuria!" appeared in the March 1945 issue of Amazing. Shaver insisted that the whole thing was true, and even though he had added 20,000 words to Shaver's original 10,000-word story, Palmer was more than happy to play along. (The cover of the June 1947 issue proclaimed: "THE SHAVER MYSTERY: THE MOST SENSATIONAL TRUE STORY EVER TOLD.) The issue did gangbusters, as did subsequent issues featuring Shaver's stories. Even if they didn't begin to believe them, plenty of readers happily lapped up these scifi tabloid tales. It seems that a handful of people, however, did believe in the so-called Shaver Mystery. Soon, the pages of Amazing were packed with letters from people who claimed that they, too, had been captured by Deros and experienced telepathic messages from the world below. Shaver Mystery Clubs formed to investigate Shaver's claims. Shaver continued to churn out stories, and Palmer continued to publish them as "truth." But even as the Shaver Mystery sold magazines, many Amazing long-time readers and writers despised the sensationalism that had taken over the magazine. In 1948, the Deros won and Amazing stopped publishing Shaver's stories. Shaver attempted to continue publishing the stories on his own, but wasn't nearly as successful with Palmer's guiding typewriter. Meanwhile, Amazing returned to publishing science fiction stories that were clearly labeled as fiction. In the 1970s, Palmer revealed that Shaver had been treated for paranoid schizophrenia, perhaps during those lost years Shaver claimed he'd spent with the Deros. The Man-eating tree of Madagascar: Edmund Spencer's article on Crinoida Dajeeana, the man-eating tree, appeared in the April 26, 1874 issue of the New York World. It purported to contain a letter from Karl Leche, a botanist traveling through Madagascar. While visiting a local people known as the Mkodo, "Leche" said that he witnessed a sacrifice to carnivorous tree, which would suddenly spring to life and wrap its human prey in powerful tendrils, squeezing her to death. According to Museum of Hoaxes, at the time of its publication, the story attracted a fair amount of interest, but then continued to hang around, appearing in magazines years after the original New York World story. Many suspected it was a hoax, and in 1888, Frederick Maxwell Somers debunked it in his magazine Current Literature, claiming that Spencer had come up with the idea of a monstrous Venus Fly-Trap during a conversation with some friends. That didn't put a stop to the hoax, however, and it continued to creep, spreading its fictional branches into the 20th century. Former Michigan Governor Chase Salmon Osborn recounted his search for the tree in his 1924 book Madagascar: Land of the Man-Eating Tree. A 1932 United Press wire story reported that a Royal Geographical Society member planned to lead a hunt for the botanical horror. Finally, in the 1950s, science writer Willy Ley delved into the mystery, and discovered that neither Leche nor the Mkodo ever existed. He wrote the whole thing off as an old joke that had gotten out of hand. From beginning to end the "Petrified Man" squib was a string of roaring absurdities, albeit they were told with an unfair pretense of truth that even imposed upon me to some extent, and I was in some danger of believing in my own fraud. But I really had no desire to deceive anybody, and no expectation of doing it. I depended on the way the petrified man was sitting to explain to the public that he was a swindle. The body was in a sitting posture, and leaning against a huge mass of croppings; the attitude was pensive, the right thumb resting against the side of the nose; the left thumb partially supported the chin, the fore-finger pressing the inner corner of the left eye and drawing it partly open; the right eye was closed, and the fingers of the right hand spread apart. Try it yourself and take a look in the mirror. David Rorvik's In his Image: The Cloning of a Man: The Raelians were hardly the first fraudsters to claim that a human being had been cloned. David Rorvik was a graduate of Columbia University's School of Journalism, a medical reporter for Time, and a contributor to the New York Times. So, when he published In his Image: The Cloning of a Man in 1978, people took notice. Rorvik claimed that in 1973, a wealthy man referred to only as "Max" approached him about pulling together a human cloning project. According to the book, after a few years, a woman was implanted with an ovum containing Max's DNA, and a healthy baby boy was carried to term. The book's upcoming publication was front-page news on the New York Times. Rorvik was interviewed by Tom Brokaw. The book sold well and spark debates about the ethics of human cloning. Of course, not everyone was convinced; plenty of people cried hoax, including at least one scientist whole research was cited in the book. Derek Bromhall, who said that portions of his doctoral thesis were used for as a theoretical basis for this cloning process, filed suit against Rorvik's publisher, J. B. Lippincott, claiming the book was a fraud. When Rorvik failed to provide any evidence that such a clone existed, the judge in the case found that the book was a hoax. Although In his Image is generally regarded as a work of fiction, Rorvik has continued to maintain the truth of his account. In 1997, he wrote an article for Omni (keep clicking the "Next" button to read it), standing by his claim that a human clone really was born in 1976. Some folks still wonder if it could be true. Was the First Human Clone Born in 1978?